As we noted in our last blog post, adding a deck to your home can be one of the most worthwhile investments. But deck projects can get complicated in a hurry. That’s why it’s important to take a step-by-step approach to ensure that you cover all the bases. Consider this post as your guide to making all the right choices for your deck. The most likely first step of your deck project is brainstorming why you even want one in the first place. Do you plan on hosting gatherings throughout the summer? Could a hot tub eventually be in the works? Then you probably want a fairly large deck with plenty of room for walking around. If you imagine that plenty of grilling and barbecues will take place on the deck, then you’ll probably want to make sure that there’s room for a prep station and serving area. To ensure that your guests are comfortable, you may want to consider built-in perimeter seating. It’s also a good idea to choose handrails with a wide, flat cap where guests can rest their drinks. Your deck doesn’t only need to be used for huge parties. There’s nothing better than soaking up some sun as you kick back and relax. It’s a good idea to figure out how much space you’ll need for several lounge chairs and a low table or two. Plus, if your local code allows it, a fire pit makes chilly nights cozier and adds to your deck’s ambiance. How nice would it be to get home from work and enjoy a family dinner or dinner for two on your deck? Just be sure that your desired table will fit comfortably. To play it safe, a good rule of thumb is to add four feet all the way around the table so that there’s walking room. Whether or not you hire a professional deck builder, it’s always a good idea to head outside on your own and outline your deck’s measurements. 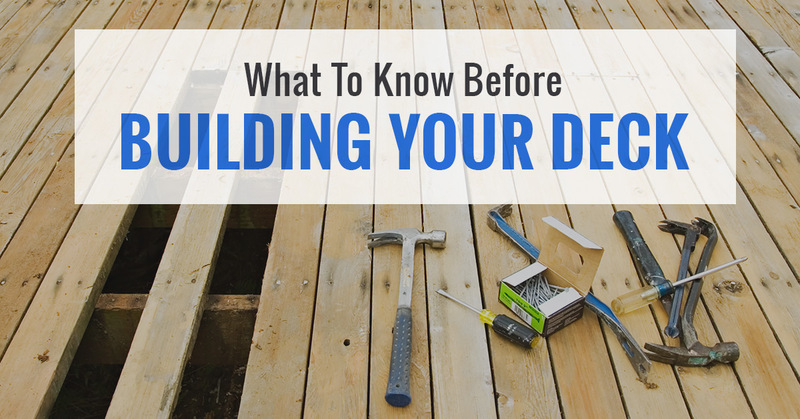 This will help you determine if you have enough clearance for your deck. You can also gauge the shape, circulation, and views that you and your potential guests would have. Wood – It’s the most visually appealing of the bunch and is easy to work with. Wood decks take stains and waterproofing easily. Depending on the type of wood, it may require frequent cleaning, resealing, and restaining. Composite – For homeowners wanting a wider selection of colors and textures, composite materials come in handy. If cared for properly, it won’t splinter, crack, or rot. However, it’s not nearly as beautiful as wood. PVC – Those in more humid climates may want to consider PVC material for their deck. After all, it provides superior resistance to moisture and doesn’t swell or shrink. PVC is also easy to clean. But similar to the composite, PVC isn’t all that attractive. Cedar, Redwood – Both are incredibly durable and offer natural insect resistance. They’re easy to work with and look great, but are also only available in select areas. Cedar and redwood are costly as well. Tropical hardwood – It can last for years if cared for properly and on a regular basis. The major drawbacks, though? Tropical hardwood can be pricey and installation is labor-intensive. Most outdoor decks fall into two patterns: basketweave or accent boards. With basketweave, short boards form squares laid in alternating directions. Often times, your local deck builders can size the squares to your preference and even add bridging between joists for extra support. Accent boards, meanwhile, involve opposing miters inlaid into the rest of the field. A deck contractor will lay out joists and bridging to ensure that each board spans at least two supports. Design for a sunny spot – A pergola can provide a shield against the hottest time of the day, while still allowing you to enjoy some rays. Design for yards with trees – Did you think that you wouldn’t be able to install a deck because of your trees? Well, as long as the trees are healthy, you can work around them. Deck builders should know to leave at least three inches around the trunk to accommodate growth while making sure the tree’s base has access to water and air. Design for dense neighborhoods – Decks can instantly bring much-needed privacy for a home. Even if your house is close in proximity to your neighbor, your deck should be able to provide a barrier. Before you get too far into the deck building process, be sure to take a look at your local codes and homeowners association. There are likely requirements pertaining to size limits, aesthetic choices, and other factors. When it comes to high-quality, affordable decks, customers choose Ready Decks. From gorgeous ready porches to incredible pool decks, Ready Decks has it all. With dependable services and locations across four states, we can help you achieve the deck of your dreams. Contact us today and get started on the best home investment you’ll ever make!